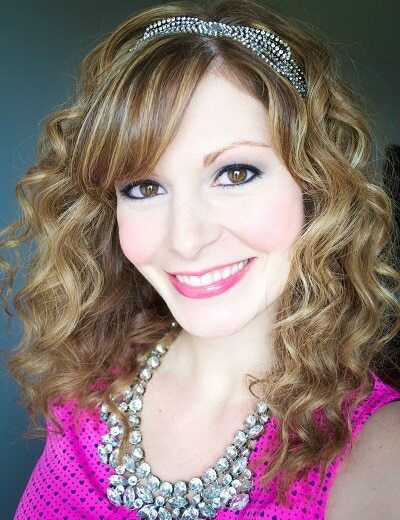 Thanks to Hellmann’s and Kitchen Play for sponsoring this post. All opinions and text are 100% my own. With the kids back in school, many of us are packing lunches everyday. Today I am sharing a Favorite Lunchbox Sandwich that all my kids love – even the ones to little for school. My daughter started 1st grade last week and that means we are back to packing lunches everyday. Sometimes she likes to do it herself – or at least help, but most of the time I do it for her and hope she likes, and actually eats, what I pack. Last year, for kindergarten, she wanted a sandwich every single day. This year she is mixing it up a bit, but sandwiches are always a favorite. The one that I’m sharing today is nothing outrageous, but all of my kids love it, and anytime they all actually finish a meal, it’s worth celebrating. I don’t remember exactly what was on it, but it was some kind of lunchmeat with cheese and lettuce, and mayo. We always had Hellmann’s mayo on hand for sandwiches. It was a pretty tasty sandwich and it kind of ruined me for pb&j, ha! I like using Italian sub rolls for this sandwich because my kids think it’s special bread, and it gets them excited to eat lunch! I use ham and turkey along with cheese, lettuce, and tomato. Hellmann’s mayonnaise is a must, of course. And can I just say I love the new squeeze bottle? No more mayo all over my girl’s hands from trying to scoop some out of the jar. 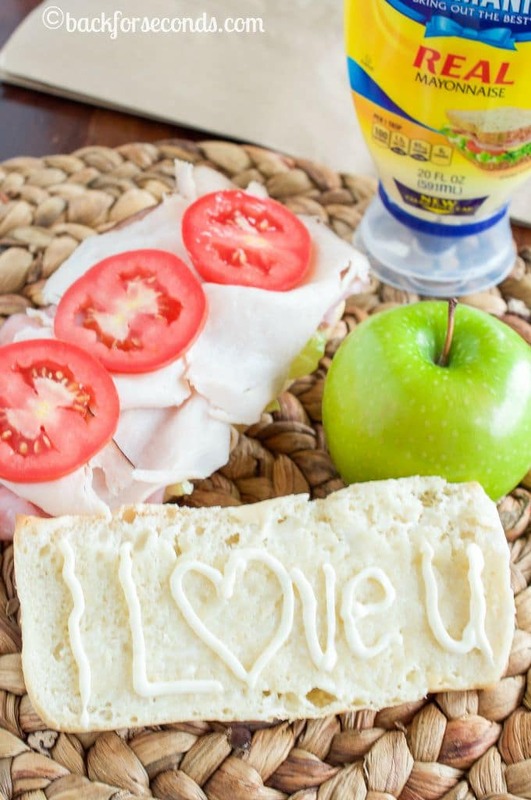 The precision tip is easy for her to use, and it makes it easy to write notes or little designs on the bread, which is always fun for kids! And the handy clean lock cap is great! You can find a coupon for the new #SqueezeMoreOut Hellmann’s Mayonnaise bottles here. 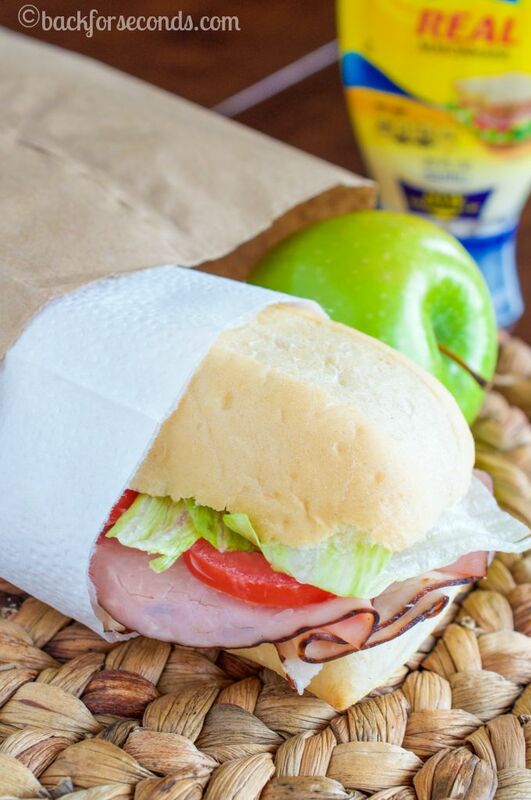 Cut sub roll lengthwise and add mayonnaise, cheese, ham, turkey, lettuce, and tomato to one half of the roll. Top with other half of the roll and enjoy! Best Foods (what Hellman’s is called over here on my coast) is the ONLY kind of mayonnaise that I will buy. I’ve tried others before but nothing else makes a sandwich, dip or dressing quite like it. I love the simplicity of the sandwich and using the sub bread to get the kids excited about lunch! Aww, how cute! My daughter starts school in less than a week and I cannot wait to make her lunches! She has told me the do-not’s: “salad, cucumbers, and tomatoes,” haha! I do love a good sandwich. 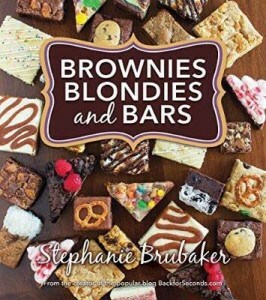 Is it just me, or do they always taste better when someone else makes them for you!? I got my first taste of school lunches this summer when my 4 year old twins went to camp with a packed lunch, they are total sandwich lovers too! Food made with love is the best food! Delish! I love mayo very much! 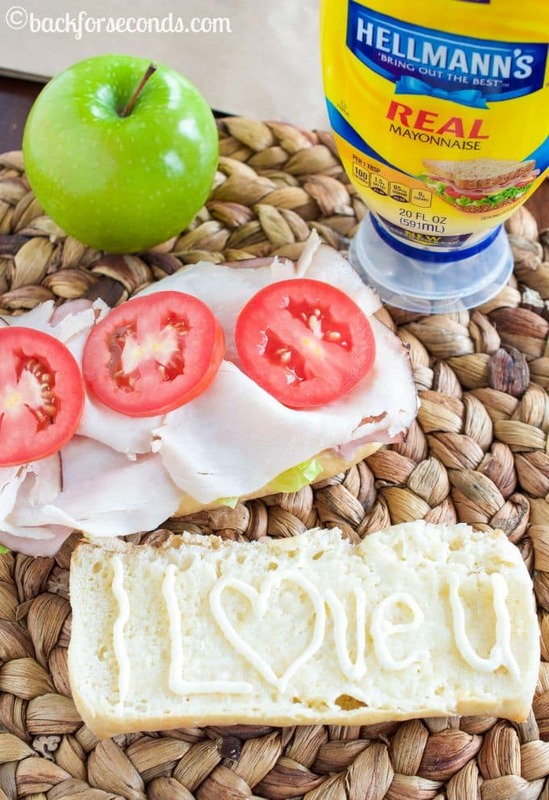 Your I love you in mayo on the sandwich is utterly adorable! 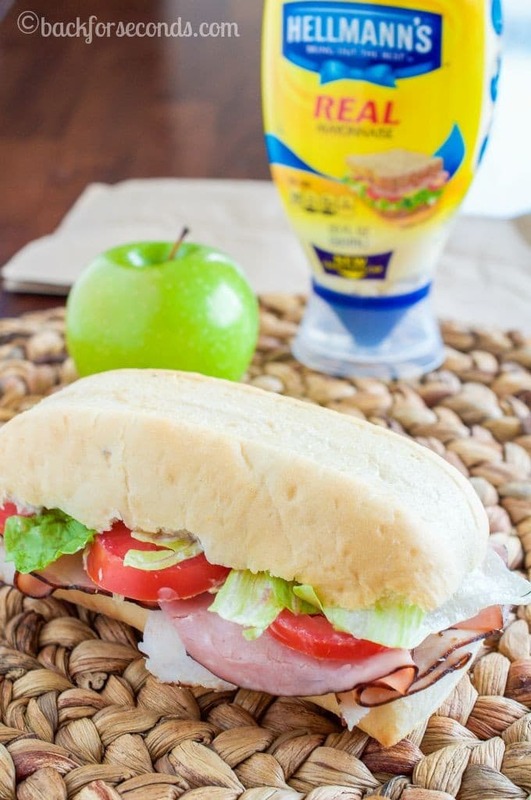 Adding Hellmann’s, lettuce and tomato sure makes a huge difference in a ham or turkey sandwich! Suddenly, I’m VERY hungry!